„Wouldn’t it be great if the egg just consisted of yolk? !“ said my grandfather when we enjoyed some hard-boiled eggs as part of a supper. He had a tendency to be self-indulgent, that’s for sure. My grandmother gave him a disdainful look, knowing too well that his lack of restraint was not limited to egg yolks. I admire the dualism of the albumen and the yolk. It is as if mother nature has given us a quiz of how to play culinary domino. I suppose most people have have more egg whites than yolks leftover (unless you are a meringue addict or a bodybuilder). But in case you do have a recipe that asks for more egg whites than yolk, here is a very simple way to use up a leftover egg yolk: cure it! All you need is good quality sea salt and a bit of patience. I use about half a cup for one yolk. Gently place the yolk in a shallow dish filled with fine sea salt. Cover it with more salt, cover the container with a lid and store in a fridge for 4 days. The salt will extract most of the liquid from the yolk. You could add some herbs to your salt to infuse the yolk with some additional aromas if you like. 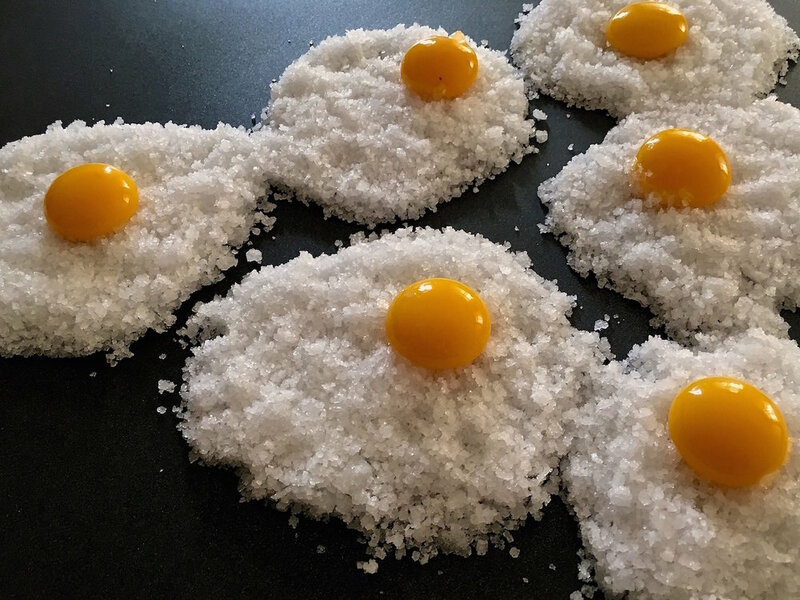 After 4 days carefully remove the yolks from the salt. Rinse them under cold water to remove the excess salt. Pat dry gently with kitchen paper and place on a baking sheet lined with paper. Dry in a preheated oven set at 65 degree celsius (150 degree fahrenheit) for 1.5 - 2 hours. I would urge you to use good quality fine sea salt, rather than common salt, which I find can be rather bitter in flavour. And obviously use the freshest organic eggs you can find. I grate this over pasta tossed with butter, crostini topped with mashed beans. Have you tried curing yolks and what do you like to use them for?